"Granddaughter I Love You More" etched on this beautiful double heart pendant is a gift your loved one will want to wear every day! 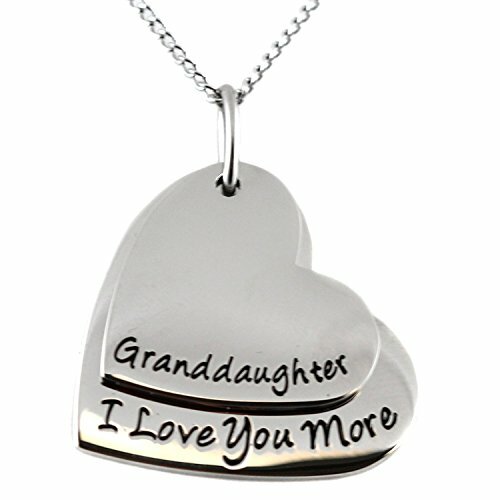 This contemporary, high styled two piece necklace says it all; a wonderful way to show your granddaughter just how special she is. A perfect gift to let her know she is always in your heart. "Granddaughter I Love You More" etched on this beautiful double heart pendant is a gift your loved one will want to wear every day! This contemporary, high styled two piece necklace says it all; a wonderful way to show your granddaughter just how special she is. A perfect gift to let her know she is always in your heart. 18" adjustable chain and velvet gift pouch are included. If you have any questions about this product by Steal My Heart, contact us by completing and submitting the form below. If you are looking for a specif part number, please include it with your message.